To lure premium buyers, Peugeot is counting on an exterior design for the 508 that it calls "French chic." Peugeot's new diesel-electric hybrid 508 sedan will be the greenest large car in Europe, the company says. Peugeot says the 508 hybrid will have CO2 emissions of 99 grams per kilometer and use of 3.8 liters per 100km (62 U.S. mpg). The car will produce zero emissions when driving in full-electric mode. Currently, only smaller-sized cars such as the Toyota Prius and Auris gasoline-electric hybrids and diesel versions of the Volkswagen Polo and Smart ForTwo emit less than 100g/km of CO2. Variants of the 508 with gasoline and diesel engines will go on sale at the start of 2011 after a debut in October at the Paris auto show. 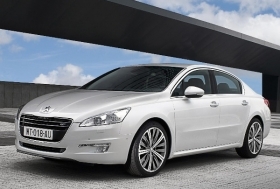 Peugeot did not say when the diesel hybrid, called the 508 HYbrid 4, will go on sale. The 508 will replace two slow-selling Peugeot cars -- the 407 mid-sized car and the 607 large sedan. Last year, 407 sales in Europe declined 45 percent to 36,718 units, while 607 sales fell 48.5 percent to 1,880 units, according to UK-based market researcher JATO Dynamics. Peugeot has big ambitions for the 508, which the company believes will be able to compete against premium cars such as the Audi A4, BMW 3 series and Mercedes-Benz C class. “It's a segment dominated by German manufacturers and we want to regain our share of that market,” PSA/Peugeot-Citroen brand director Jean-Marc Gales told Automotive News Europe in March at the Geneva auto show. To lure premium buyers, Peugeot is counting on an exterior design it calls "French chic," a mixture of elegance and timeless lines which could be equally at home in Paris or London, the company said. Inside, the 508 is fitted with high-quality materials and details, as well as what Peugeot says is an exceptionally large interior room and a very generous trunk space. The 508 will be offered in two body styles: a 4790mm-long, four-door sedan and a 4810mm-long station wagon. Peugeot said the 508 would have the company's latest engine technology, including a new e-HDi stop-start system, which offers improved performance plus a fuel-consumption reduction of up to 15 percent compared with versions without stop-start. The 508 HYbrid 4 will have the same diesel-electric hybrid drivetrain that Peugeot will launch in the 3008 HYbrid 4 compact car in March 2011. The 200-hp hybrid drivetrain has a 2.0-liter diesel engine that provides 163 hp to drive the front wheels, while the remaining 37 hp comes from an electric motor that powers the rear wheels. The 508 will be built Rennes, France, for the European market and in China for the Chinese market. The China launch is mid-2011.